In May some 29 grade 6 students boarded a Tokyo-bound plane for the much-anticipated annual trip to Japan. There, the students reunited with their buddies from Harker’s sister school, Tamagawa Academy. “This was one of the biggest groups yet! The trip went really well and all the students had such a wonderful time in their homestays,” recalled Jennifer Walrod, Harker’s director of global education. Joining this year’s trip as a chaperone was Gayle Calkins, the middle school’s assistant to the counseling and global education departments. “After working on sending students and chaperones to Japan over the last nine years, it was great to actually experience the welcoming and friendly students and staff of our sister school Tamagawa! Japan and all its sites, people and experiences will be something I will cherish always,” said Calkins. The Harker contingent first headed to Tokyo’s oldest temple, the Asakusa Sensoji Temple. Legend has it that two brothers, while out fishing one day, caught a statue of Kannon, the goddess of mercy. Although they put the statue back in the water, it continued to return to them, so the temple was built nearby in her honor. Next up was a scenic drive was to Kamakura, a coastal town an hour south of Tokyo. The group’s first stop was at the Kotokuin (Great Buddha) Temple to see an enormous bronze statue of Buddha. From there, they drove to Tsurugaoka Hachiman Shinto Shrine. The following day, the group arrived at Tamagawa Academy, where they were greeted by their buddies and host families, who waved signs and cheered while the school band played in the background. “After the students were introduced to their homestay parents and siblings, we were ushered into the auditorium for the morning’s entertainment, an energetic Taiko drum performance by their upper school students. The kids loved this! A group of sixth grade students then sang before our kids performed their speeches in Japanese. They did a great job!” recalled Walrod. The Harker students accompanied their Tamagawa buddies to a number of classes, including math, Japanese, science and P.E. They also had an opportunity to venture over to the lower school, where they did some activities with the younger students. Later, they met with Yoshiaki Obara, president of Tamagawa, to share their experiences so far during the trip. 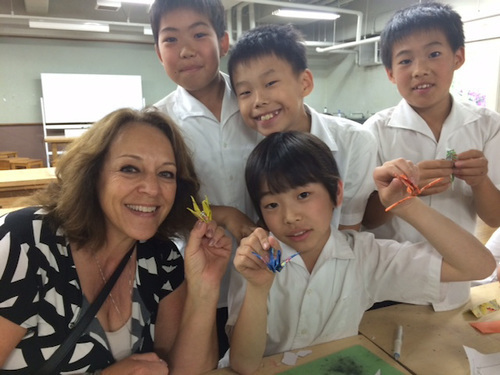 A highlight of their time at Tamagawa was visiting the Future Sci Tech Lab. Here the kids learned about Tamagawa’s research into developing horticulture technologies to provide food in outer space without soil or natural lights. When it was finally time to say goodbye, the Harker group was led out to the bus by the Tamagawa students, teachers and parents. Their farewell was filled with hugs, photos and tears. As they departed, they passed many students lining the sidewalk waving goodbye. On their last full day in Japan, the group visited Hiroshima. Their first destination was the Peace Memorial Park, where they visited the Atomic Bomb Dome, which marks the spot where the first atomic bomb landed in Japan. The ruins at the site (also known as “ground zero”) are dedicated to those who died at the site. Continuing through the park, the group stopped briefly at the Flame of Peace, which has burned continuously since 1964. “This flame continues to burn as a symbol of the Japanese anti-nuclear resolve to burn the flame until all nuclear weapons are gone from this earth,” said Walrod. “The students took time to read personal stories of survivors and take some photos. We then walked along the river to the Children’s Peace Monument built to commemorate all the children who had died. We stood in a circle and talked about peace and what we personally could do to make the world a better place,” remembered Walrod. They also had the opportunity to hear from the daughter of a woman who had survived the bombing. She talked to the students about the lead up to the fateful day and then shared her mother’s story. This marked the first time Harker students had an opportunity to listen to such a personal story in Hiroshima. The group then headed off to the scenic Arashiyama monkey park, a popular tourist spot located just outside of Kyoto. At the top of the mountain, the students fed Japanese snow monkeys by going onto a special cage and giving them chestnuts through wired windows. Shortly after, everyone headed back to the airport for the long flight home, which gave them plenty of time to reflect and reminisce on all they had seen and done in Japan.